It seems like the hottest, coolest home accessory right now, that made the whole world talking about it is … a pillow. 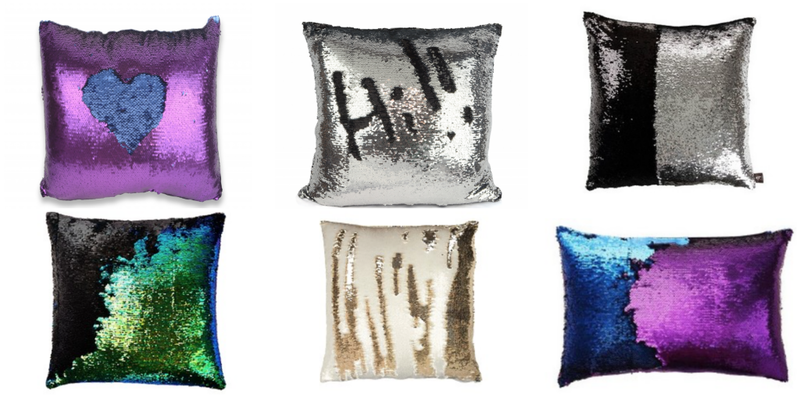 Well, not any ordinary pillow, but a sequined pillow that changes color. Discovered by chance by journalist Steve Noviello while visiting a Nebraska Furniture Mart, he shared a video while playing with these “magical” products. The video went viral, with more than 32 millions views on Facebook. That’s WOW, especially for some pillows. So, what is it with these pillows? They were created by San Diego-based designer Aviva Stanoff from a double-sided sequined fabric, showing a different color on each side of the sequin. The fun part comes next: you can draw, write words, monograms or whatever your imagination allows you to, so your pillow transforms into a different one, depending on the new drawing. Then, just swipe it and do something else. My daughter would play with it for sure, I would play with it too, so I guess this is what it makes so many people want to spend 150$ on the damn thing… it’s really not just a piece of decor anymore, it’s a new game for grownups. Even though after this video everyone wants the fun pillow, the price tag is not so fun. I guess we will soon see some other versions of the Mermaid Pillow, probably at lower prices, manufactured by other companies. This is what usually happens with a great idea at a big price. It will be fun to follow the evolution of this product and the craziness around it. So, do you want a Mermaid Pillow?